Mortgage lenders who were sloppy with important paperwork in the hey-day of the housing boom are now turning to questionable practices to clean up their mess so they can foreclose on homeowners. It all stems from the lenders inability to “produce the note” when they try to take someone’s home. To get around the break-down in paperwork, these companies hire people to be “fake” Vice Presidents to sign documents from one company to another, so a foreclosure can proceed. The St. Petersburg Times exposed the practice in an investigative report, in which they interview CWN founder Chris Hoyer. Despite the turmoil in the lending industry, Bryan Bly seems to have no trouble finding a job. On Aug. 3, 2007, Bly signed a document as vice president of Option One Mortgage. On Feb. 13, 2009, Bly signed a document as vice president of Deutsche Bank. And on Feb. 18, 2009, Bly initialed dozens of documents – this time as vice president of Citi Residential Lending. In fact, Bly never worked for any of those. His real employer is Nationwide Title Clearing, a Pinellas County company that helps lenders clean up problems that can complicate efforts to foreclose. Bly, who lives in a Clearwater trailer park, is one of several Nationwide employees authorized by lenders to sign as “vice president” in assigning loans from one company to another. Assignments are key in determining who actually owns the loan, an issue that has become all-important as banks foreclose on millions of loans that were bundled into securities and sold to investors. Nationwide says the assignments and other services it handles for lenders help ensure everything is legal and above board if they sell a loan or need to foreclose. “We’re pretty much sticklers that what we put in the record is legitimate,” says Jeremy Pomerantz, a Nationwide spokesman. Critics, though, say that Bryan Bly and “vice presidents” like him at similar companies are part of an assembly-line process designed to resolve a big problem: In the rush to “flip” loans as fast as possible in order to make more money, the new loan holders often failed to get the proper paperwork showing they owned the loan and had the right to foreclose. At a time when one in every 159 American homes is in foreclosure, the seemingly slapdash way in which loans change hands is giving homeowners a tool to delay or even stop the foreclosure process. More and more judges are demanding that the party seeking to foreclose prove that it owns the loan “note” – the borrower’s promise to repay the debt. In New York, a judge dismissed Deutsche Bank’s motion to foreclose on a $408,000 loan last year because it had started foreclosure proceedings while the loan was still owned by IndyMac Bank. The judge said he wouldn’t reconsider the case unless Deutsche explained why one woman – Erica Johnson-Seck – had signed as vice president of two different companies. The judge also said he was “perplexed” as to why both Deutsche and IndyMac had the same address, and why an affidavit by Johnson-Seck, who supposedly worked in California, was notarized in Texas. In New Jersey, another foreclosure case was thrown out after the “vice president” for Deutsche Bank acknowledged she was only an assistant secretary. “She said she was told to fill out the paperwork however it needed to be done in order to make the document look valid,” Napolitano said. To help homeowners protect themselves from questionable, even illegal foreclosures, Tampa attorney Chris Hoyer started the Consumer Warning Network last year. The Web site, which now gets as many as 80,000 hits a day, gives tips on challenging foreclosures – “Make ’em produce the note!” – and sample letters for contacting lenders. 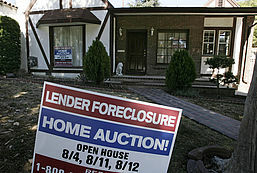 “The intent is not to get someone a free house, but to delay the foreclosure and put pressure on the lender to negotiate,” said Hoyer, a former federal prosecutor. Among those who have been helped by the site is Thomas Worthington, who lost his information technology job in November. Although he has yet to miss a payment on his Sarasota home, he decided in February to try to modify his loan terms. That’s when Worthington learned that the right to collect his payments had been sold to American Home Mortgage Servicing, AHMS. But public records showed that the loan itself had been assigned to Deutsche Bank on a document signed by Crystal Moore, a vice president of Citi Residential Lending. Suspicious, Worthington sent the company a letter asking for the loan note, appraisal and other documents proving that it really did own his loan. The response he received might help him fight foreclosure if it ever comes to that. Worthington’s loan wasn’t the only one assigned to Deutsche Bank in February. Records in Pinellas, Pasco and Hillsborough counties show scores of assignments with Crystal Moore as vice president. Moore appears to have been in a big hurry – instead of signing her full name she scrawled a single loopy initial. Like Bryan Bly, Moore is actually an employee of Nationwide Title Clearing. And the assignments she and Bly initialed in February were done under a contract with Citi Residential to make sure Deutsche Bank was shown as the owner of thousands of securitized loans. Founded in 1992, Nationwide is a private company that occupies a swath of low, white buildings in Palm Harbor. From 300 to 400 employees at the peak of the real estate boom, Nationwide now has about 115 who handle tax and title searches, lien releases and other services for dozens of lenders. It also updates information for MERS, the electronic mortgage tracking system created by the lending industry to reduce paperwork and recording fees as loans change hands. But it is exactly that assembly-line process that makes critics wonder if “vice presidents” can be certain that what they are signing is accurate and legal. Susan Taylor Martin can be reached at susan@sptimes.com.